Easy to Assemble Molded Yellow ABS with no sharp edges comes with a 1 year Manufacturer's Warranty. Certified Greenguard Indoor Air Quality and Children and Schools Certification. Tested to preserve indoor air quality. Available in Playpanel Sets and Individual Panels that offer a variety of choices, activities and play options to create that perfect room divider for any play area. Flexible hinges link panels together and make for easy storage and folding. Colored Panels are made of hygienic cleanable vinyl. Sets must be ordered as shown. Square Panels are 31" square. Rectangle Panels are 31" X 48" and may be used upright or sideways. Big Screen Panels are approximately 48" X 60" (47.5 x 59.5) and may be used upright or sideways. Sets can be attached to walls with wall attachment or gate latch (available separately unless otherwise noted). Cantilever Legs are included with sets only but must be purchased separately when ordering individual panels. See Accessories. Corral encloses a quarter circle play area for little ones with an 8’ radius. This set features our new Wall and Gate Latch Attachments. Attaches to any wall. Gate Latch allows adult entry and exit. 5 piece set can be used with Cantilever Feet Set included. Use as Room Divider or a self-standing play corral where children can play inside or outside the corral. 8' Radius. Thirty-one inch square panels flexibly link together to form protective and quiet areas. Set of 3. Vinyl mat not included. Set of 5 square panels in new soft and dark Woodland tones. Individual Square Panels also available. Use these 3 rectangles horizontally or vertically to screen or separate activities. 31” x 48” and set comes with one pair of Cantilever Legs for stability. Set of 5 rectangle panels in new soft and dark Woodland tones. Individual Rectangle Panels also available. Set of 3 rectangle panels in new soft and dark Woodland tones. Individual Rectangle Panels also available. 4 Playpanel set includes porcelainized Magnetic Dry Erase Panel, plus Fuzzy Loop, Transparent and Mirror Play Panels. Each panel is a single activity, but together a center for multiple use, plus space defining barriers. Cantilever feet included for stability. Pockets shown on Dry Erase Panel no longer available. Graphic appliqued A, B, C and defining symbols. 4 feet high, these 3 panels snap together for multiple uses. Safety feet set provided. Set of 3 Panels that bring smiles and giggles to any room. A round sewn in mirror is featured on each panel to reflect the happy faces peering in. Panels can be used either vertically or horizontally. 4 feet high, these 3 panels snap together for multiple uses. Safety feet set provided. Set of 4 Big Screens can be used horizontally or vertically to screen off areas. Safety Feet included. Set of 5 Big Screen panels in new soft and dark Woodland tones. Individual Panels also available. Set of 3 Big Screen panels in new soft and dark Woodland tones. Individual Panels also available. 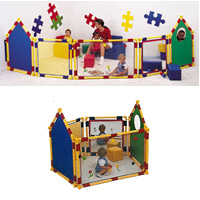 Choose any of the four colorful 90 degree angle room screens to create a separate dramatic play or housekeeping area or create for separate spaces with four panels. Available in Red, Green, Blue and Yellow. Set of 8 portable Big Screens (4' x 5' each) solve even the toughest space issues. Different solid color plain panels combine with a Velcro, See-Thru Mesh, Transparent vinyl and Art Display super size screens. Complete with flexible hinges for attached flexibility and fold up storage. 4 portable safety legs included for stability. NOW AVAILABLE IN FULL COLOR SOLID SETS OF ALL BLUE, GREEN, RED OR YELLOW. Now Available in Woodland Colors Too. Products are Shipped Freight or UPS/Fedex Prepaid. Allow 3-4 weeks for delivery.